andBeyond Ngala Safari Lodge is the essence of pioneering Kruger history combined with sumptuous luxury in a family friendly environment. Ngala is 15 000 hectares (35 000 acres) of the epic and exclusive Kruger National Park. Tracking an endangered white rhino, through the green summer grass on a golden misty morning allows the ancient African wilderness to restore your soul. Scrumptious pan-African cuisine tantalises your palate on the deck overlooking the camp waterhole or in the boma suspended under the Milky Way’s heavenly canopy. andBeyond Ngala Safari Lodge is nestled in the shade of a cool green mopane forest infused with an atmosphere of rich history and the ultimate tranquillity of the African wild. The 21 exquisite thatched cottages are appointed to conjure the inspiration of the brave early naturalists who were so awed by this stunning area. The cottages boast opulent, spacious bathrooms, a bedroom with every possible comfort and a cosy seating area from which to enjoy a sherry or a book about the wonders of Africa. Each cottage has its own perfectly secluded veranda, shaded by the aromatic mopane woodland that touches the air with a subtle spicy scent. Absorb the peace of the midday on the veranda; sip your favourite cocktail while the glossy starlings and chuckling hornbills forage in the woodland. Alternatively laze in the crystal waters of the pool overlooking the waterhole where thirsty elephant slake their thirst shaded by an ancient tamboti tree. In the middle of the day, browse the extensive collection of Africana – books, jewellery, clothes and tasteful artefacts in the curio shop. Outside the shop, absorb the primordial tranquillity of the Kruger in the sublime calm of the outdoor lounge in the gilded shade of three old fever trees. At tea time, take refuge in the coolth of the sumptuous lounge and watch a herd of 250 buffalo wind their way down the water’s edge – bulls to roll in the glorious mud, calves to frolic in the shallows. Out in the wild, Ngala offers the wildest Kruger experience. The reserve is 15 000 spectacular hectares of exclusive wilderness bisected by the iconic Timbavati River. This ageless river’s picturesque banks are dominated by forests of African giants – mohagany, ebony, fig and boer bean – where Ngala’s confiding leopard find refuge in the deep green and elephants wait out the lazy heat of the lowveld midday. 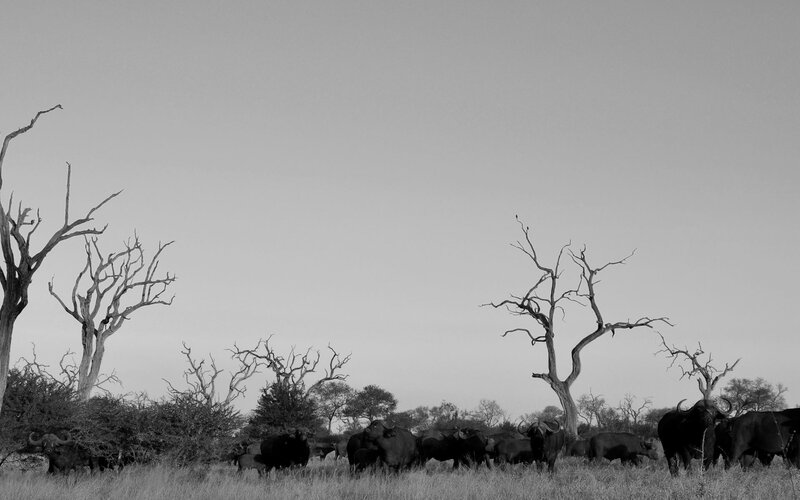 Away from the Timbavati, herds of 600 buffalo gather at the waterholes in the ginger dusk. On the floodplains, prides of up to 25 lions rouse, black-maned males roaring, cubs cavorting in the twilight, lionesses stretching before heading into the night to hunt. As the soft light of the African dawn touches the eastern horizon, and the last hyaena whoops fade into the passing night, packs of wild dogs course onto the clearings to hound the abundant plains game gathered to graze. Ngala wilderness activities include adventurous dawn and dusk game drives and gentle walks from camp in the middle of the day. For those wanting to truly communicate with this ancient land, tracking walks in the misty morning to find a white rhino is the ultimate wilderness experience. An experienced ranger and tracker team leads you into the morning on the trail of an endangered white rhino – an experience that will, enchant, re-awaken and enthral every sense. Ngala is specially equipped to offer safe African adventures to children without sacrificing sophisticated luxury and relaxation for parents. The lavish family suite, has its own huge pool overlooking the Mapona River, two spacious bedrooms, and a dedicated game ranger. This is ideal for younger families because activities in the wild can be tailor-made to suit the needs of the whole family. The superb cottages are also situated such that parents and children can be close to each other. The cuisine at Ngala is as pan-African – flavours and ingredients are drawn from the most gastronomically renowned regions of the continent. You could expect grilled beef from the highveld , succulent vegetables and sweet citrus from the lowveld, seared yellow-tail from the Indian Ocean and Arabian spices all the way from the Morocco. Breakfast and lunch is served overlooking the waterhole and its daily procession of exciting visitors. For dinner, Ngala boasts an impressive boma, centred on a roaring fire, overhung by the cascading African stars and the branches of a huge fever tree where roosting baboons are frequent observers. 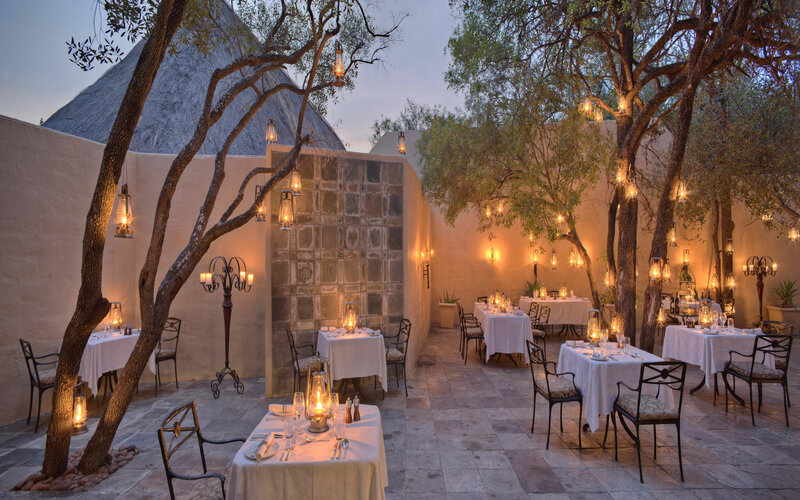 Dinner in the courtyard bathed by the soft light of 100 golden lanterns, candelabra and crystal glasses gives a sense of the colonial opulence of a bygone era. Ngala Safari Camp is easily accessible by road or by air. Iconic Africa recommends that you catch a 40 minute flight to Hoedspruit from Johannesburg OR Tambo International airport. From there, it is a very pleasant 45 minute drive to Ngala in an air-conditioned vehicle. For the adventurous, the six hour drive to Ngala is one of the most scenic South Africa has to offer. From Cape Town, we can arrange a flight to Kruger Mpumalanga International Airport or Skukuza Airport and from there an air transfer either to Hoedspruit or Ngala’s tarmac private airfield. Iconic Africa enjoys a long standing relationship with the &Beyond team which allows us swift and simple access to fantastic rates and availability. We recommend combining you safari experience with a trip to cosmopolitan Cape Town – one of the world’s most spectacular cities, a tour of the Cape’s breath-taking winelands or even a journey to one of the untouched islands floating in the tranquillity of the Indian Ocean off the coast of Mozambique. Iconic Africa acclaims &Beyond Ngala Safari Camp because it offers the ultimate African experience imbued with history, luxury, wilderness and family. One of Iconic Africa’s passionate consultants is waiting to create your ultimate family African safari experience. 15 000 hectares (35 000 acres) of the epic and exclusive Kruger National Park. Specially equipped to offer safe African adventures to children. Ngala Safari Lodge is a colonial masterpiece set in one of Africa’s wildlife wonders. To experience a combination of luxury and African sensations at this much celebrated African sanctuary simply contact one of our African travel experts and begin your journey to Africa with us now! Deeply hidden in the heart of Cape Town’s trendiest and most vibrant quarter is a Victorian beauty that dates back to the early 1800’s. The Cape Cadogan is a site to behold, a breath of fresh air, in amongst the energy that is Kloof Street. Londolozi Private Game Reserve consists of five luxurious camps and offers the absolute in first class safari experiences. Varty Camp is the original camp and is steeped in tradition. Set up by the Varty family in 1926, it holds a special place in the Varty’s hearts. The campfire of Varty Camp has warmed the nights of 88 years. Varty Camp has a well-established family heritage, and children are always welcome. In fact, if you give the camp some warning, they can even plan a special itinerary based on delighting your little ones.